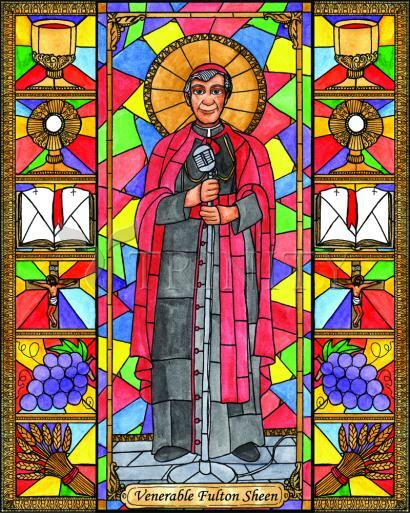 Fulton Sheen was a priest, bishop, and then archbishop who was very famous in the second half of the twentieth century. He was born in Illinois where he was an altar boy who dreamed of becoming a priest. He studied and then taught at several colleges, showing himself to be an extremely intelligent man. Though he was very smart, he had another gift as well. His unsurpassed charm and personality along with his golden voice led him to begin a radio broadcast called “The Catholic Hour.” It ran for twenty years and by the time it ended, an audience of four million tuned in each week. In 1951, television was just becoming popular and Bishop Sheen starred in his own show called “Life is Worth Living.” It was wildly successful and he was launched to stardom by preaching the Catholic faith. He used the money he made to help the poor and unfortunate. Today, the cause to name him a saint is underway. He has been named venerable, which is the second step of four to becoming a saint. Peter John Sheen was born in El Paso, Illinois, the oldest of four sons of Newton and Delia. Though he was known as Fulton, his mother's maiden name, he was baptized as Peter John Sheen. His first role in the Church was as an altar boy at St. Mary's Cathedral. After high school and college, Sheen attended Saint Paul Seminary in Minnesota before his ordination on September 20, 1919, then followed that with further studies at The Catholic University of America in Washington, D.C. His youthful appearance was still evident on one occasion when a local priest asked Sheen to assist as altar boy during the celebration of the Mass. Sheen earned a doctorate in philosophy in 1923 at Belgium’s Catholic University of Leuven. While there, he became the first American ever to win the Cardinal Mercier award for the best philosophical treatise. Sheen was for a year assistant to the pastor at St. Patrick's Church, Soho Square in London while teaching theology at St. Edmund's College, Ware, where he met Ronald Knox. Although Oxford and Columbia wanted him to teach philosophy, in 1926 Bishop Edmund Dunne of the Roman Catholic Diocese of Peoria, Illinois asked Sheen to take over St. Patrick's Parish. After nine months, Dunne returned him to Catholic University, where he taught philosophy until 1950. A popular instructor, Sheen wrote the first of many books in 1925, and in 1930 began a weekly Sunday night radio broadcast, The Catholic Hour. Sheen called WWII not only a political struggle, but also a "theological one." He referred to Hitler as an example of the "Anti-Christ." Two decades later, the broadcast had a weekly listening audience of four million people. Time referred to him in 1946 as "the golden-voiced Msgr. Fulton J. Sheen, U.S. Catholicism's famed proselytizer" and reported that his radio broadcast received 3,000–6,000 letters weekly from listeners. During the middle of this era, he conducted the first religious service broadcast on the new medium of television, putting in motion a new avenue for his religious pursuits. In 1951 he began a weekly television program titled “Life Is Worth Living.” Filmed at the Adelphi Theatre here in New York City, the program consisted of the unpaid Sheen simply speaking in front of a live audience without a script or cue cards, occasionally using a chalkboard. The show, scheduled in a graveyard slot on Tuesday nights at 8:00 p.m., was not expected to challenge the ratings giants but did incredibly well. Life and Time magazine ran feature stories on the then Bishop Sheen. The number of stations carrying “Life Is Worth Living” jumped from three to fifteen in less than two months. There was fan mail that flowed in at a rate of 8,500 letters per week. There were four times as many requests for tickets than could be fulfilled. In 1952, Sheen won an Emmy Award for his efforts, accepting the acknowledgment by saying, "I feel it is time I pay tribute to my four writers—Matthew, Mark, Luke and John." Time magazine called him "the first 'televangelist'", and the Archdiocese of New York could not meet the demand for tickets. One of his best-remembered presentations came in February 1953, when he forcefully denounced the Soviet regime of Joseph Stalin. Sheen gave a dramatic reading of the burial scene from Shakespeare's Julius Caesar, substituting the names of Caesar, Cassius, Mark Antony, and Brutus with those of prominent Soviet leaders Stalin, Lavrenty Beria, Georgy Malenkov, and Andrey Vyshinsky. He concluded by saying, "Stalin must one day meet his judgment." The dictator suffered a stroke a few days later and died within a week. He was consecrated a bishop on June 11, 1951, and served as an Auxiliary Bishop of the Archdiocese of New York from 1951 to 1965. Yet, the show ran until 1957, drawing as many as 30 million people on a weekly basis. In 1958, Sheen became national director of the Society for the Propagation of the Faith, serving for eight years before being appointed Bishop of Rochester, New York, on October 26, 1966. He also hosted a nationally-syndicated series, The Fulton Sheen Program, from 1961 to 1968 (first in black and white and then in color). The format of this series was essentially the same as “Life Is Worth Living.” Sheen was credited with helping convert a number of notable figures to the Catholic faith, including agnostic writer Heywood Broun, politician Clare Boothe Luce, automaker Henry Ford II, Communist writer Louis F. Budenz, theatrical designer Jo Mielziner, violinist and composer Fritz Kreisler, and actress Virginia Mayo. Each conversion process took an average of 25 hours of lessons, and reportedly more than 95% of his students in private instruction were baptized. While serving in Rochester, he created the Sheen Ecumenical Housing Foundation, which survives to this day. He also spent some of his energy on political activities, such as his denunciation of the Vietnam War in late July 1967. On Ash Wednesday in 1967, Sheen decided to give St. Bridget’s Parish building to the federal Housing and Urban Development program. Sheen wanted to let the government use it for African-Americans. There was a protest, since Sheen acted on his own accord. The pastor, understandably, disagreed, saying that “There is enough empty property around without taking down the church and the school.” The deal fell through. On October 15, 1969, one month after celebrating his 50th anniversary as a priest, Sheen resigned from his position and was then appointed Archbishop of the Titular See of Newport (Wales) by Pope Paul VI. This ceremonial position allowed Sheen to continue his extensive writing. Archbishop Sheen wrote 73 books and numerous articles and columns. Sheen died of heart disease on December 9, 1979, having previously had open-heart surgery at Lenox Hill Hospital. He is buried in the crypt of St. Patrick's Cathedral, near the deceased Archbishops of New York. The official repository of Sheen's papers, television programs, and other materials is at St. Bernard's School of Theology and Ministry in Rochester, New York. Sheen was declared Venerable Servant of God by Pope Benedict XVI on July 28th 2012.